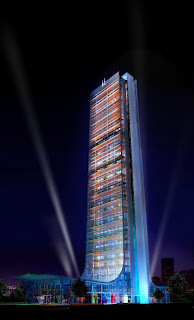 Istanbul Sapphire, the 261m-high skyscraper claimed as Europe’s tallest building, has been unveiled in Istanbul, Turkey. Designed by Turkish architectural firm Tabanlioglu Architecture, Istanbul Sapphire is a high-end luxury mixed-use project costing almost $250 million. Sapphire is the tallest building of Istanbul's Levent main business district and the second tallest building in Istanbul and Turkey. It is strategically located in the middle of the city's central Besiktas, Etiler and Sisli districts. The 64-storey Istanbul Sapphire is at 368 meters above sea level and 238 meters above ground with a structural height of 261 meters including its spire, which is part of the design. Istanbul Sapphire features 64 floors with 54 above-ground and 10 basement floors. It also includes communal living floors, six parking lots, a 35,000 square metre shopping mall, 22 different 174 dwellings and 47 floors for residences. The skyscraper features specialised floors with private gardens between every three floors, along with a communal living area or mechanical floors separating every nine floors from each other. Istanbul Sapphire incorporates various eco-friendly elements in the design such as vertical gardens, recreational areas and technological features, becoming the first ecological building of Turkey. It features two special glass shells, which enable the infiltration of outside air naturally through holes located at every three floors. These glass shells protect residents from negative weather conditions and external urban noise, besides providing a buffer between the outside atmosphere and the internal facilities. Absorption of the sunlight and ultraviolet beams are ensured by a special curtain system that is automatically controlled through a computer, depending on the season, day and hour.